18 years after Super Smash Bros’ initial release, a slew of indie games are challenging its dominance of the platform fighting genre. Rivals of Aether, Brawlhalla, and Melee Masters are all upcoming indie platform fighters riffing on the theme Smash has been singing for two decades—one that 2013’s Towerfall circled with its archery-based play. Players battle it out with their choice of character on one of the game’s platform-based stages. If you fall off the map, you die. 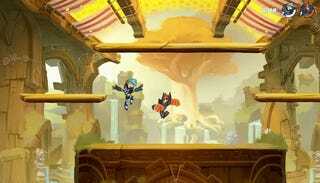 You can shield against other players’ attacks, fight in the air or string together moves in punishing combos. If you’ve played some Smash and pick up any of these games’ betas, the gameplay and user interface are intuitive. In some, you can triple-jump or parry instead of shield, but the formula is there; it just got a makeover. Calling them “rip-offs” would be ungenerous. They’re variations sporting a more grassroots spirit than Super Smash Bros’. For players searching for the same formula with more unique fighters, a more responsive dev team and a less inundated competitive scene, these games can offer a lot. 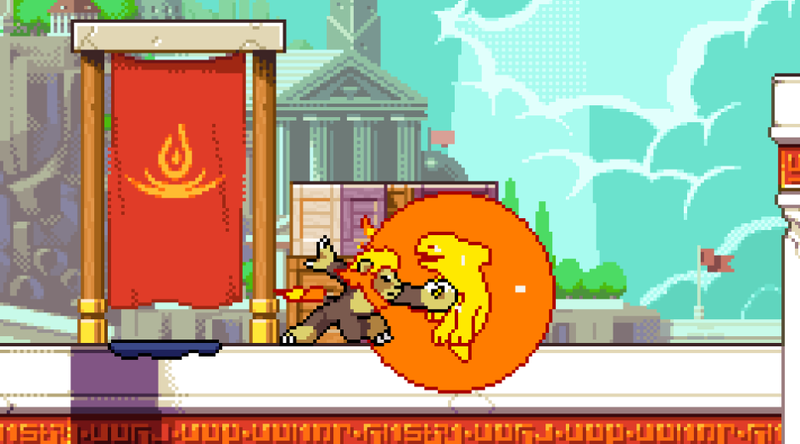 “We have seen some Smash-style games in the past,” Rivals of Aether developer Dan Fornace told me, “but often, they are looking to replicate the ‘mascot brawler’ aspect of Smash and not the ‘platform fighter’ aspect that we see at tournaments.” Rivals of Aether is a platform fighter out now on Steam Early Access, to be released next week. It features original, humanoid animal characters drawn in soft pixel art. Unlike 2012’s All-Stars Battle Royale for the PlayStation Vita, a platform fighter featuring Sony mascots, Rivals of Aether came up with a fresh, original cast of heroes. Each manipulates the element fire, earth, water or air, creating a rock-paper-scissors dynamic. There’s a warrior lion with a fiery mane, a ripped beetle man who can pull rocks from the ground and an elk who can engineer lightning from her hooves. Without generations of history attached to each character, players may initially be less excited about indie rosters. When Nintendo included Final Fantasy’s Cloud in Smash 4, it was an invitation to Final Fantasy’s fan base to check out their platform-based brawler. Pre-made audiences are easy targets. The makers of these indie games know that. Brawlhalla’s cast includes an Aztec warrior queen, a dwarf with a rocket lance and a masked cyberpunk fighter with a diesel-powered heart. “Everyone in the office picked their favorite archetypical character,” Dolce explained. Recently, on the heels of a long-running /r/Brawlhalla gag about a made-up character named Mordex, Dolce decided it would be funny to actually write a “Mordex” character into the game. Fans went wild. Every two months or so, the team will add another “Legend,” which Dolce says they’ll keep doing until their fan base moves on to another game. In that way, these indie platform fighters are more populist than Smash. You could write Nintendo every day about balance changes and never hear back, even if it’s the most reasonable suggestion on Earth. That feeling of yelling into the abyss was, in part, what spawned Super Smash Bros. mod Project M. It was a wildly popular game that satisfied complaints waged against over-powered characters like Metaknight. Intended as a middle ground between Smash Bros. Brawl and Melee, Project M was downloaded several million times. But, in 2015, the team stopped developing it. Allegedly, fans speculate, it was out of fear of Nintendo asserting copyright rights. Melee Masters developer Michael Azzinaro doesn’t understand why the Project M community didn’t just come out with its own original game. “There was clearly drive and passion in the community to create and play a spiritual successor to SSBM,” he told me. Released 15 years ago, Melee is likely not going to receive balance patches or an online mode, something Project M sought to address. Several Smash fans consider Melee the pinnacle of the game’s competitive potential. It’s drawing record eyes to tournaments, with 220,000 viewers on its EVO 2016 tournament stream last summer. But Melee’s competitive scene can feel unapproachable because its skill ceiling is so high. With so much advanced tech and such a developed meta, a rising competitive star is a distant possibility. Directional influence, long hitstun times, fast-falling and a few other factors make it competitive, and while those skills are certainly masterable by any dedicated fan, it is extremely unlikely that we’ll see another “Melee God” sneak into the top five rankings. They’d just be too far behind. Brawlhalla, Melee Masters and Rivals of Aether all added in directional influence, or control over the direction your character goes when they’re hit. In fact, in Brawlhalla’s early days, its fans, who were mostly Melee followers, told its developers that the game didn’t have a chance at an esports scene without it. But while the tech is in there, the skill ceiling doesn’t exist. “I love combos and aggressive gameplay but I am not good enough in Melee to get them consistently,” Rivals of Aether’s Fornace told me. “We simplified some of the harder tech in Melee while keeping the speed and combo-ability of it,” he says, adding that players can be “flashy without the frame-perfect inputs.” Fornace says that, after playing through the tutorial, some players said it helped them understand some aspects of Melee’s tech for the first time. Because these games are (or will be) on Steam and can be played online, they’re also easier to play against friends than Melee. For Brawlhalla, that’s been a huge draw. Last year, the developers invited a few hundred of their top players to Atlanta for a tournament with a $50,000 prize pool. Even though the game is still in beta, some of its top players already have sponsors. Let’s be real: Indie platform fighters’ competitive scenes are probably never going to eclipse Melee’s or Smash 4’s. But most Smash players aren’t about to dominate $50,000 prize pools. This emerging contingent of indie platform fighters isn’t being made to topple Smash, although their competitive scenes could help generate hype. They’re being made to diversify a genre that desperately needs something fresh.